It took me awhile to decide what to sketch for this challenge - and finally sorted through old photos to find one of me 40 years ago with my long braid. It was cut one year later and I never let it grow that long again. I still need lots of practice sketching faces and my husband says that it doesn't look anything like me. 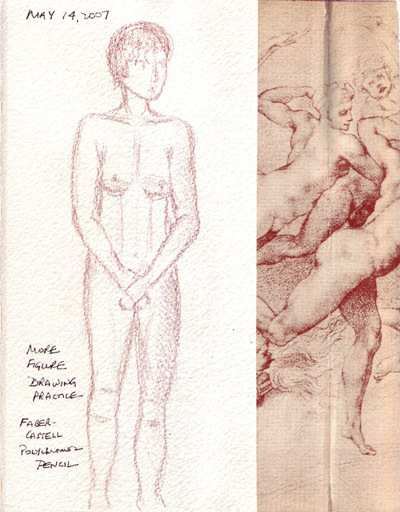 I continue to practice figure drawing and enjoy adding them to my recycled Michaelangelo book. But I will never buy rough watercolor paper again - just have to get through these pages! Yesterday the tagging spread to our EDM members and since everyone needs to tag 7 more people, I'm not sure how quickly and how far this will spread. It is fun to do and definitely will help to develop more of a community among our EDM group members - if we know a little more about each other. So in order to pass the Tag along, I decided that I would like to tag any EDM member who joined the group in the last 6 months. After you post "7Things" to your blog, please leave a message on the EDM message board so we can all visit and get to know you better. We spent several hours in Central Park with my son, daughter-in-law and grandson Robbie in celebration of Mother's Day. The weather was beautiful and the Great Lawn was full of families and softball players. 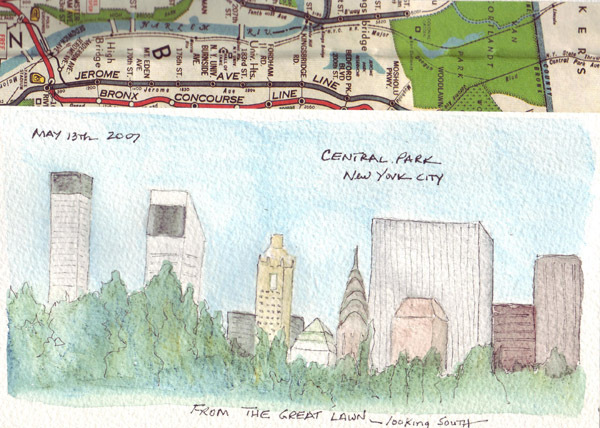 I sketched the city skyline looking south from the Great Lawn at 86th St. I still hate the rough watercolor paper. 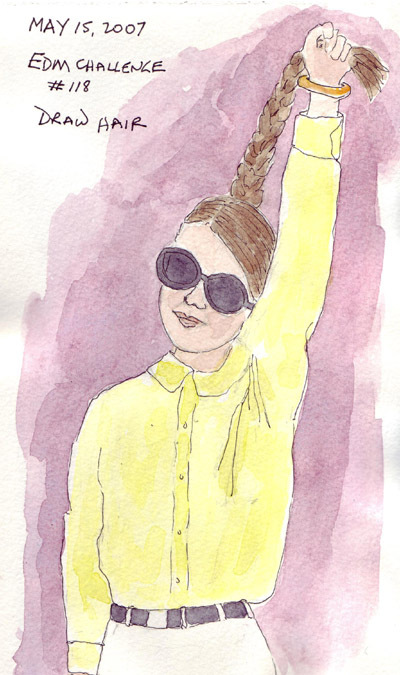 This sketch was done in my NYC Journal using Albrecht Durer watercolor pencils. The piece of subway map that is above my sketch is my addition to the journal to cover the gap between signatures. Today was my monthly Empire Quilt Guild meeting which is held on the 8th floor of Building A at Fashion Institute of Technology (FIT). I arrived early to meet with my small applique group and while sipping more coffee sketched the view from the window - another NYC rooftop image. 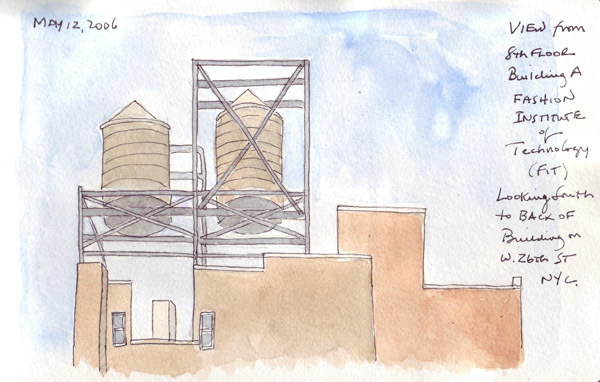 I'm not sure what fascinates me about these water tanks. If you take a minute to look up in the city, they are everywhere! And no two structures or rooflines are the same. This is the back of the buildings on W. 26th St.